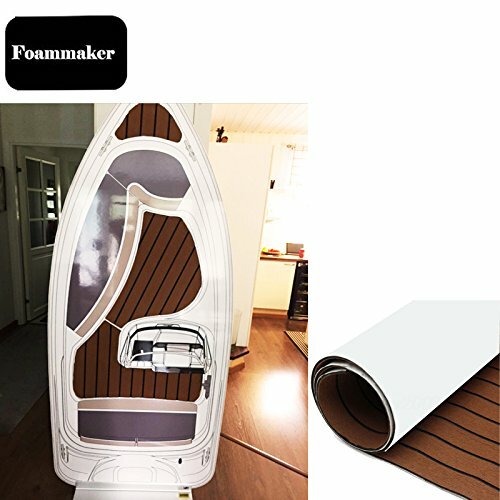 Material: Marine Grade EVA, Backed with 3M adhesiveLength: 240 cm / 94 inchWidth: 90 cm / 35 inchThickness: 6 mm / 0.24 inchStyle: Brown with Black LinesQuantity: 1pc x Boat Flooring Decking PadNote: FOAMMAKER EVA Foam Faux Teak Sheets can be used for Boat flooring, RV flooring, Swimming pool flooring, Garden flooring. 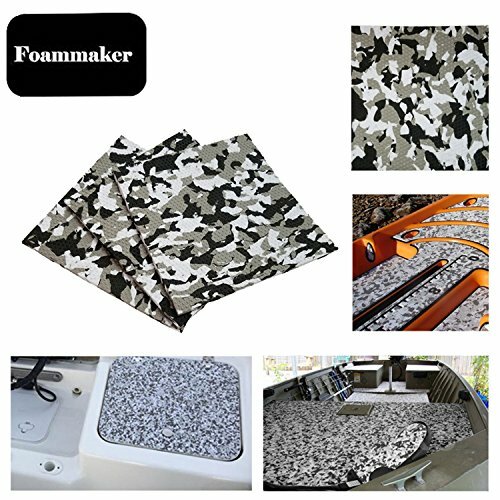 The 6mm thickness soft high quality EVA material cover the hard floor, provide a non-slippery, soft and durable surface for your boat in both wet and dry conditions.FOAMMAKER Boat Flooring Decking Pad is specifically designed to be used in the marine environment. Installation is easier, could stick down anywhere on your boat! EVA foam is very stain and mildew resistant. FOAMMAKER products are backed by a 3 year warranty against defects in material. 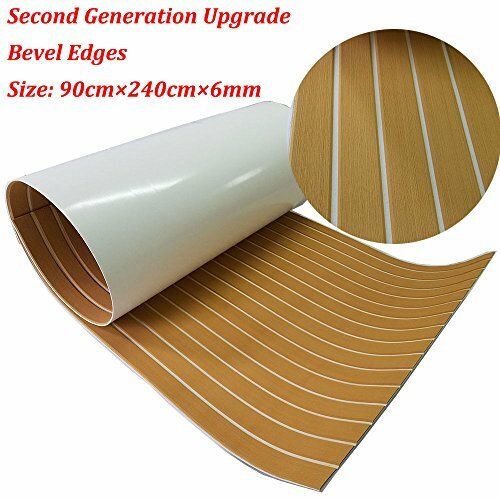 Specifications:Material: Marine Grade EVAColor: Grey/ Black Lines Length: 190cm/75"Width: 70cm/28''Thickness: 0.6cm/2.4'' Strong glue at the back.Quantity: 1pc x Teak DeckingApplication: 1. Boat flooring;2. RV flooring;3. Swimming pool flooring;4. Garden flooring.Note: 1.Please allow a bit error due to manual measurement. please make sure you do not mind before you bid.2.Due to the difference between different monitors, the picture may not reflect the actual color of the item. 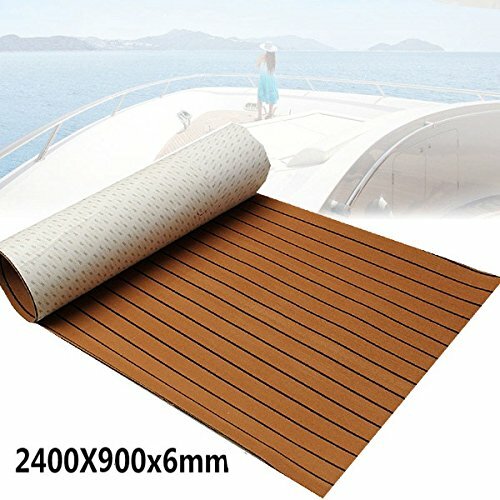 EVA decking sheet is a new, popular, easy DIY flooring for the boat or yacht deck, even swimming pool or garden or RV.Size: 240cm x 90cm （35.4" x 94.5"）Thickness: 6mmMaterial: EVA (Marine Grade)Color: Dark Brown with Black linesStrong glue at the back.Features:- UV resistant.- With strong adhesive.- Non-skid.- Heat resistant.- Shock absorption.- Non-absorben foam.- Soft yet durable.- Protection for surfaces.- Easy to clean with water.- Easy to cut and install.Note: 1.Please allow a bit error due to manual measurement. please make sure you do not mind before you bid.2.Due to the difference between different monitors, the picture may not reflect the actual color of the item. Details of 6 mm thick 28 "x 98"
Specifications:Material: Marine Grade EVAColor: Marine Embossed(Black/Blue) Length: 250cm/98"Width: 70cm/28''Thickness: 0.6cm/0.24'' Strong glue at the back.Quantity: 1pc x Teak DeckingApplication: 1. Boat flooring;2. RV flooring;3. Swimming pool flooring;4. Garden flooring.Note: 1.Please allow a bit error due to manual measurement. please make sure you do not mind before you bid.2.Due to the difference between different monitors, the picture may not reflect the actual color of the item. 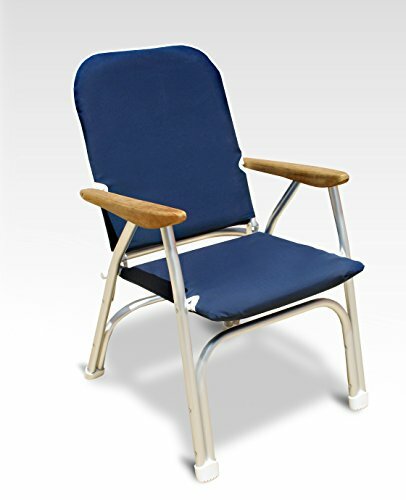 The name FORMA stands for high quality marine furniture serving the well-being of our customers. 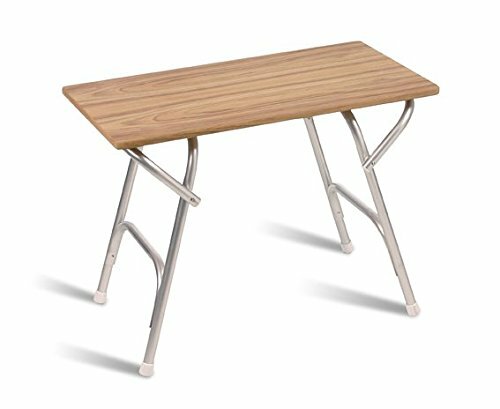 We produce aluminum folding furniture in Europe since 1979. Through the years we have accumulated valuable experience and knowledge. 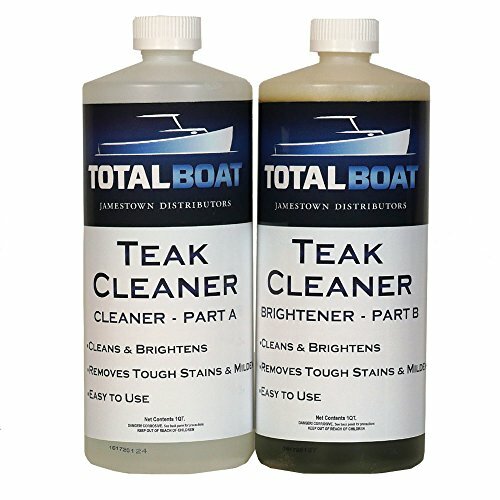 16 oz, teak cleaner, safe, easy to use formula, cleans teak & other fine woods, removes stains & weathering, use as the first step in the restoration of gray, weathered teak, no need to sand after cleaning, does not raise wood grain, cleans teak with no hard rubbing, ideal for use on teak furniture & home decks, will not harm fiberglass or painted surfaces, prepares fine woods for oiling & sealing, contains no dangerous acids. 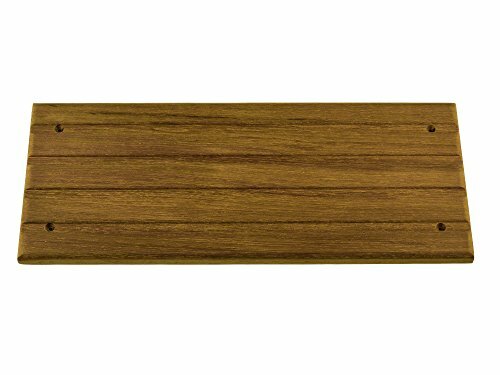 Copyright © Wholesalion.com 2019 - The Best Prices On Teak Marine Deck Online.